A new CodeXL release is out! For the first time the AMD Developer Tools group worked on this release on the CodeXL GitHub public repository, so the global community had access to all of the source code modifications as the work on this release progressed. Did you follow us? Come join the fun of CodeXL development on the CodeXL GitHub repo. 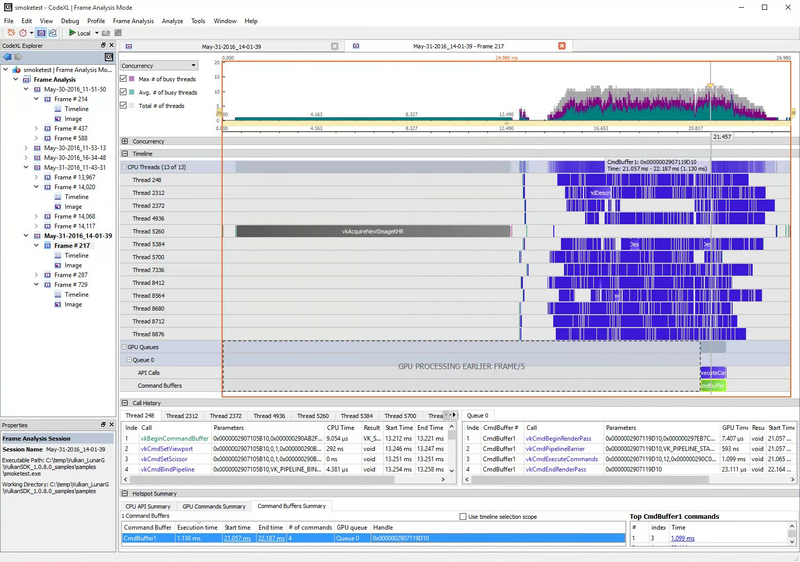 CodeXL now supports capturing a trace of Vulkan™ frames for games and apps running on Microsoft Windows®. The command lists/buffers are displayed in the timeline chart, separated per queue and immediately next to the individual commands they consist of. The Summary pane contains a table of command lists/buffers, complete with the execution time of each command list/buffer and other details. You can configure CodeXL to capture a trace of multiple frames in a single capture operation. Moving the mouse over the timeline chart is reflected in a corresponding indication on the navigation ribbon. CodeXL now displays the details and content of OpenGL® and OpenCL™ objects while debugging C++ host code on Linux®. We improved the UI by removing the Source Files sub-tree from the CodeXL explorer. Shader files are now located in the program or folder which provides the context in which they will be built. New go-to line number (CTRL+G) feature in the source code viewer/editor of all CodeXL modes. Developers and users are submitting issues to the CodeXL issues page and we’re responding and fixing them. As with every release, we included many bug fixes. Check the release notes for a complete list. Please use our CodeXL issues page to provide feedback about CodeXL and for support requests.